For students of all ages – explore the bells, the architectural spaces, the treasures, the crypt and chapels, discuss the incredible with a variety of presenters, historians and philosophers. St George’s Cathedral welcomes people of all faiths and none, and is known for encouraging an enquiring conversation, and welcomes discussions with students on any aspect of spirituality, faith and Anglicanism. Programmes are designed to meet any of your needs. They may be specific with regards to curriculum council units or devised especially for you. We will work with you to create full, half-day or two hour programmes to meet the specific interests of your group. Programmes can be designed for younger or older students or a combination of both. A warm welcome awaits staff and students who visit St George’s. Students are encouraged to explore, question and enjoy their time with us. Sessions are interactive, informal and student-centred. To download a copy of the brochure and enquiry form, please click here. 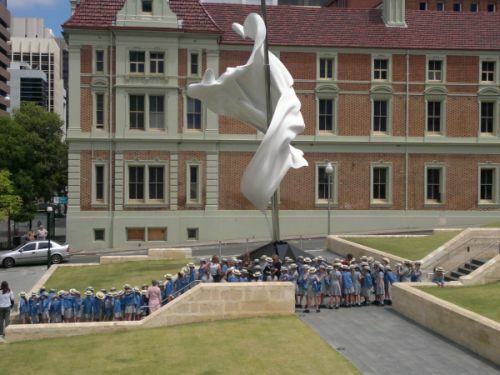 Junior School students from St Hilda’s Anglican School for Girls, after attending their annual service in the Cathedral. Discover meaning and purpose – why a Cathedral?